A red flag with a white canton containing a red cross (couped, i.e. not reaching the edges of the canton). Ferreting in search of Tongan flags information, I found an image of the national flag in the Tongan Consulate in San Francisco website which instead of 1:2 is (exactly) 3:4. Also the canton is not half as high as the flag but around 2/5ths. Tonga was a British Protected State from 18 May 1900 - 4 June 1970. The best information I have (garnered from a number of sources) is that the flag was adopted in 1866 (during the reign of King George Tupou). It was enshrined in the Constitution of 4 November 1875 (last amended 21 February 1991), and remained in use during the Protected State period. A British Protected State was a state with a recognised sovereign ruler that did not have relations with Foreign Powers except through the British Government. Protected States did not have Blue Ensigns or defaced Union Jacks. For Tonga: PMS 032 red. The vertical flag is simply the horizontal version turned 90 degrees clockwise. The construction details in Album des Pavillons (2000) (shown above) are different from those obtained from the Flag Institute (shown below). Earlier sources, like Flaggenbuch (1939) and National Geographic (1917), show the flag in a 2:3 ratio, but I am somehow ready to dismiss them as unreliable. Does anyone have any information on a possible change in the ratio some time after WWII? Anyway, Album des Pavillons (2000) gives construction details as (3+3):(5+7). The details of the cross are not given, but apparently match the Flag Institute specification. Flaggenbuch does not provide construction details, presumably even Neubecker could not get them. This may be further indication that 2:3 ratio of shown in the period might not be correct. The Flag Institute gives the flag construction as (1+2+2+2+1+8):(3+2+2+2+3+20), according to specifications provided by Chris Southworth. Older sources (e.g., Flaggenbuch (1939) and National Geographic (1917)) all show this flag as 2:3~. The first design  was a plain white flag with a red couped cross, but this was later found to be too similar to the International Red Cross Flag, adopted in 1863, and so the white flag was placed in the canton of a red one. The 1875 constitution states that the flag shall never be altered. Smith 1980 added that "the actual forms of the flag and arms are credited both to Prince Uelingatoni* Ngu Tupoumalohi and to Reverend Shirley Baker, a Wesleyan minister." Is Uelingatoni a local form of Wellington? The present design (...) was adopted for its symbolism (the red field is a representation of Christ's blood, and the cross also comes from Christian iconography) back in the 1870s or something on the understanding that it would never be changed. The flag and coat of arms of Tonga are credited to Prince Uelingatoni Ngu Tupoumalohi and the Methodist pastor Shirley Baker. The flag and coat of arms of Tonga are credited to Prince Uelingatoni Ngu Tupoumalohi and the Methodist pastor Shirley Baker. The inscription "KOE 'OTUA MO TONGA KO HOKU TOFI'A" means: God and Tonga are my inheritance. The Tonga Royal Arms and Flag Act is available on the website of the University of South Pacific, in Vanuatu at http://www.vanuatu.usp.ac.fj/paclawmat/Tonga_legislation/Consolidation_1988/Tonga_Royal_Arms.html. 2.Restriction on using Coat of Arms or Flag. 3.Use for business purposes prohibited. An Act to Prevent the Unauthorized Use of the Tonga Coat of Arms and the Royal Ensign. 1.This Act may be cited as the Tonga Royal Arms and Flag Act. Restriction on using Coat of Arms or Flag. 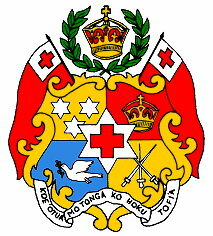 2.A person shall not, without the authority of His Majesty in Council, use in connection with any business, calling or profession the Tonga Coat of Arms or Flag of Tonga, or arms or flag so resembling them as to be calculated to deceive, in such manner as to be calculated to lead to the belief that he is duly authorized to use the Coat of Arms or the Flag of Tonga. Use for business purposes prohibited. 3.The grant of authority to use the Coat of Arms or the Flag shall not authorize the use of the Coat of Arms or Flag for business purposes or for use on any patented article. 4.The Royal Ensign is the personal flag of His Majesty and shall not be flown or otherwise displayed except when His Majesty is present. 5.A person guilty of an offence against this Act shall be liable on summary conviction to a fine not exceeding $40, and in default of payment to imprisonment for any period not exceeding 3 months. 6.No prosecution for a breach of the provisions of this Act shall be commenced without leave of His Majesty in Council.